During my studies I travel with my bike, each time with a different airlines and bike cases. At that time, I didn’t think on make my own case. 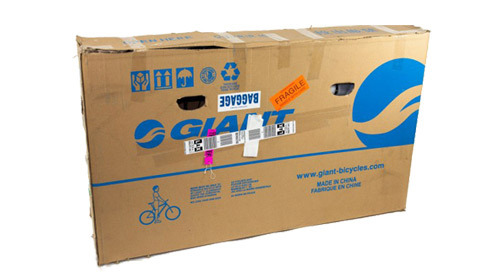 In this article, I described a carton box reinforced with a custom aluminum structure to improve the safety of the bike. I used various cases during my traveling, from carton box, soft cased to hard cases. Below some pictures. My last bike case (hard) was sold to a friend that bought a triathlon bike and need a hard case to protect his investment and new toy. After that moment, I was free of any bike case, which means I need to figure out a new way to travel with my bike safety soon. The new approach consist in use a cardboard box (from a local bike store) and an aluminum structure based on angle, plates, screws and nuts. The design could be adapted for your need and material available with your local providers. I used a box of 138cm x 19.5cm x 74cm from Giant. During the search and purchasing of the material, I didn’t find a long plate for the cross section. As shows the pictures, the long plate was reduced to the corners of the box. I prefer this solution than the original because improve strangeness and reduce weight. The holes for the screws were made during the assembly. The top structure use wing nuts for easy assembly/disassembly (not tool needed). A small fix was done in the cardboard as show the pictures (in the top) to avoid the wing nuts to fit. The aluminum structure weight is 2.4Kg while the cardboard itself is 3.5Kg, for a total weight of 5.9Kg for this custom bike case. Take in consideration (if is you first time traveling with bikes) that your airline will probably have a fee to transport your bike. During my traveling I paid from 50 to 150 USD to bring my bike. If you are traveling a lot and you are looking to reduce (or remove!) this fee, I suggest to try a soft case declaring it as anything different of a bike, as described by Ray here. You can download the drawing (2D and 3D) including an estimation of material used here. During a travel in Asia the bike case was in perfect conditions, except some scratches in the cardboard which were stop by the aluminum structure, hopefully!